Will Captain Picard (Patrick Stewart) actually defy the Federation to prevent the lo-tech, hippy Ba'ku being forcibly ejected from their paradise by the nasty Son'a? The idyllic Ba'ku colony was built at Lake Sherwood, south of Thousand Oaks, to the northwest of Los Angeles. The lake has been a favourite location since the silent era, and is even named for its role in the 1922 film of Robin Hood, with Douglas Fairbanks Sr.
More lake scenes used the San Gabriel River at the San Gabriel Reservoir, about seven miles north of Azusa, east of Pasadena. 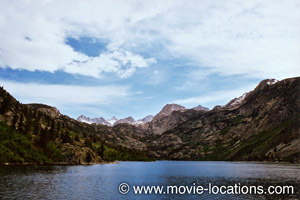 The Ba'ku mountain refuge filmed on an inaccessible (unless, like the cast and crew, you have access to a helicopter) mountaintop above the beautiful Alpine reservoir, Lake Sabrina, a lake created in 1908 by damming the middle fork of Bishop Creek, 19 miles west of Bishop, on Route 395. It's part of Inyo National Forest, which is also home to natural wonders including Mt. Whitney (the highest point in mainland USA), the extraordinary Mono Lake, Mammoth Lakes Basin, and the Ancient Bristlecone Pine Forest.